We had our family Christmas party New Year’s Day. My college age girls left afterwards to go visit their dad for a couple of weeks before they start school again. I guess that means that the holidays are officially over. I am sitting on my couch looking around and there is so much that needs to be done. Have you been procrastinating your post-holiday deep clean? Cleaning, organizing, decluttering. It’s a dreaded task for me. Are you feelin’ it, too? 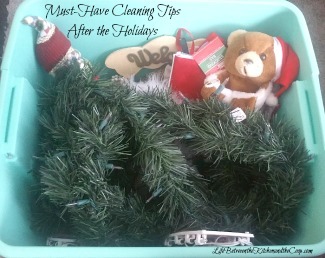 Well, fortunately, I am prepared with some must-have cleaning tips for after the holidays! Let’s get motivated! We can do this! The most obvious thing that needs to get done is putting away all of the holiday decorations. Did you do that yet? Whether you celebrate Christmas, Hannukah, or another holiday this time of year, there are usually lots of decorations. Take those suckers down and put them away! I love to use large Rubbermaid containers to store them. It keeps them organized and protected. The next thing I do is get rid of the the obvious “eyesores”. That means it is time to declutter. Look around the room for things that are obviously out of place. Husbands socks on the living room floor? Gone. Mail in a pile on the kitchen table? Pitch the junk and make a neat stack of the important stuff to go through later. Don’t need something? Donate it to Goodwill or some other charity. Check out these other tips for decluttering in your home, including the bathroom, I don’t know about you, but our bathroom is one of the worst clutter-offenders in the house! Check out this affiliate link for a really cute bathroom organizer from Amazon. Once you have cleared the clutter and organized a bit, it’s time to start with the deep cleaning. I always like to do that before I go back to my non-holiday home decor. Things like dusting, floors, getting the laundry under control, cleaning fingerprints off of walls…the list goes on and on. I suppose everybody has a favorite cleaning product or two. Some people are very into “green” cleaning products. Some of those can even be found around the house, saving you a trip to the store. As for me, there are a few cleaning products that MUST be in my cleaning closet. I don’t think anything cleans and sanitizes a toilet as well as Clorox toilet cleaner. Soft Scrub is essential to not having rings in the bathtub. And nothing beats Mr. Clean Magic Erasers when I need to clean the walls! One of my fellow bloggers swears by Invisible Glass Shield 2000 and Invisible Shield Surface Protectant for keeping her shower doors sparkling. What are your favorites? If you are the kind of person that can stand to deep clean for an entire day, maybe you can get it done that fast. As for me, I usually stagger it over a few days, starting with the common areas of the house (living room, kitchen, bathroom). Instead of going room by room, you could also do it job by job instead. For example, do the floors one day, the drapes and blinds another day, and so on. Doing it that way, your deep cleaning would be done within a week and you wouldn’t have to feel pressured to do it all in one day. Try not to get too frustrated with yourself if you can’t get it all done as quickly as you’d like (which is pretty much always, am I right?). I hope these cleaning tips give you some motivation and inspiration as you settle back into post-holiday life. I'll confess I just took down my Christmas decorations today! I really need to do some decluttering and deep cleaning now! I took mine down yesterday. Now it's time for cleaning. Soooo (not) excited.